Animal Friends in collaboration with the City of Zagreb and the City Department of Education, Culture and Sport organizes a series of lectures "Youth for Animal Rights: Raising the Youth's Awareness of Animals Rights and Options of Action." Young people recongize subject matters of animals rights and protection as well as ecologically conscious, sustainable and resoponsible lifestyle as important. Animal Friends has been working with young volunteers for years and there is a wide range of primary and secondary schools and universities that the organization has been succesfully working with for many years. Many of Animal Friends' projects have been taking place in collaboration with the Volunteer Center Zagreb, and it is precisely this volunteer circulation that enables the mobility and success as well as perfecting the skills of young volunteers. The problem lies in insufficient public discussions, lectures, youth workshops: the informal types of education are missing wherein young people would acquire crucial information about ways of action within this area and offer their own vision of their active participation in ecologically and ethically conscious lifestlye. Young people show a high level of empathy for animals, which is one of the most important steps toward social pluralism. 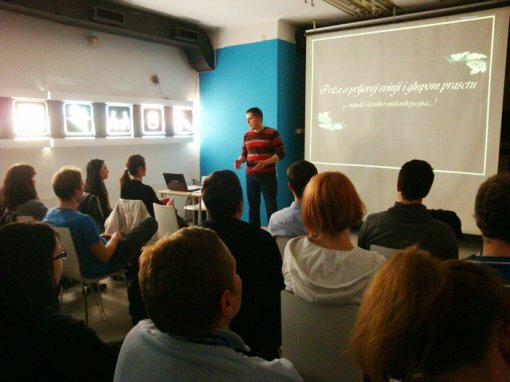 The project "Youth for Animal Rights" comprises of a series of three public lectures by Vedran Romac, a social worker and animal rights advocate and of a volunteer workshop, conducted by Marta Susak, a volunteer for many years and an Austrian education course "Youth and Animal Rights" graduate. Involved with the project are also Valentina Svegovec, a volunteer, and Jelena Lazic, a pshychology student and a member of the Animal Friends for many years. The project's advisor is Luka Oman, the Animal Friends' president. 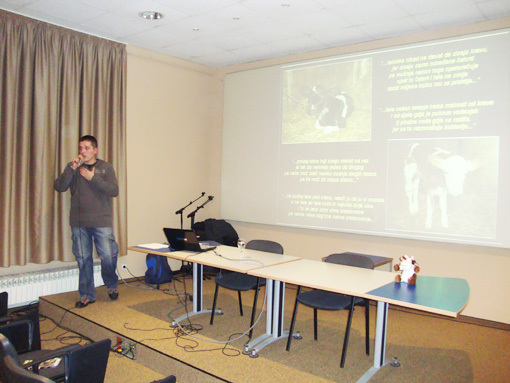 The project will also be presented in educational institutions during a 45 min lecture, which will allow enough time for a short presentation, printed educational materials, a short video and questions and answers, all together serving as an announcement of and an introduction to learning about animal rights which will continue at the public letcures, and for the most interested, at the workshop. The project will continue the next year as well.